Vegan Blog: Serving Vegan Recipes and a Life Outlook ! This was an emotional dish to make tonight because i grew up making eggplant parmesan in my italian kitchen with my mother. It’s one of the more complicated dishes she taught me to make and became a dish i took over making for big family holidays every year. We would fry up some eggplant in plenty of olive oil and eggs and bake it in a layered lasagna! (Epplant parmesan lasagna recipe to come!) So it was pretty powerful to make this healthy plant-based version for my own little family. 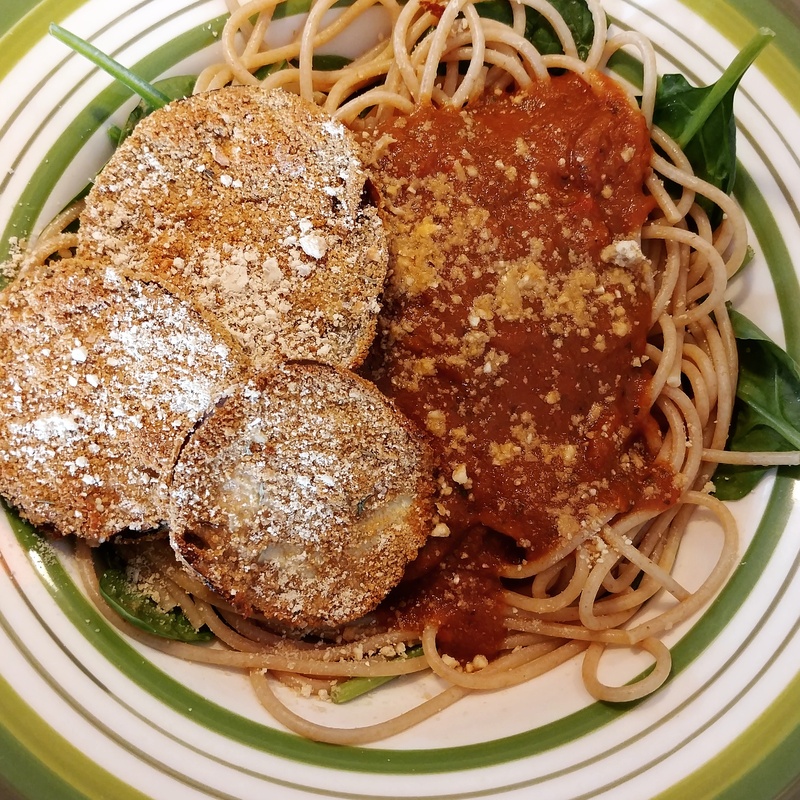 Well this minimalist bakers vegan eggplant parmesan recipe did not disappoint! The original recipe calls for frying it, no thank you! I left that part out. 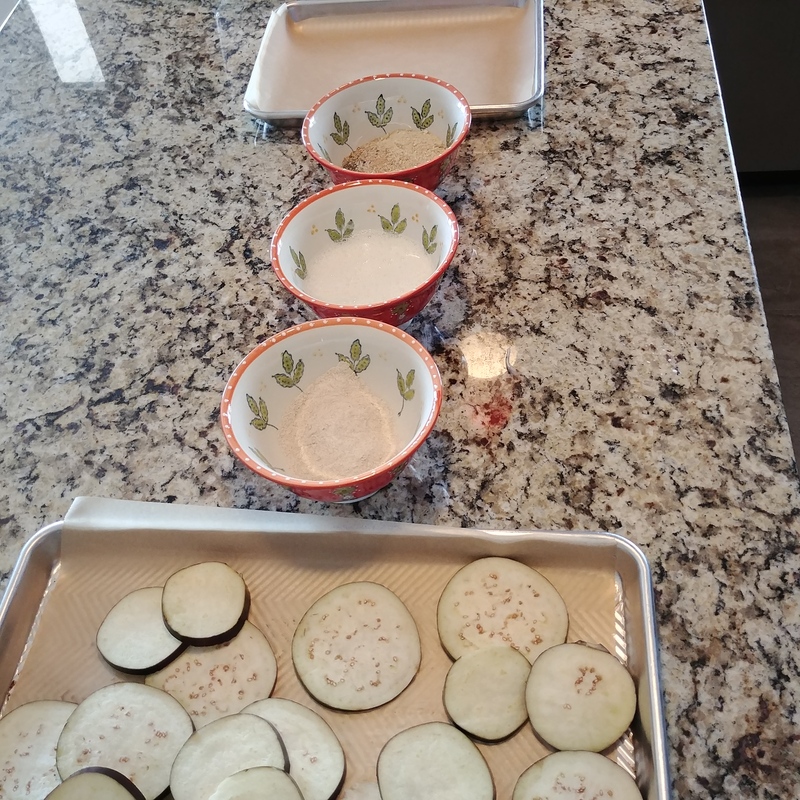 And it called for a lengthy process of salting and drying out the eggplant. Double no thank you. I left that out too. Its unnecessary, and as a busy mama with a toddler, who needs all that extra work?! Simplify! 4 Tbsp vegan parmesan (click link for recipe) hint: it’s raw cashews, garlic powder, salt, and nutritional yeast. Put the flour in bowl 1. Put the arrowroot and milk in bowl 2. Whisk it with a fork to blend. Have a parchment lined tray ready. Then go down the line coating and dipping each piece and laying them evenly on the tray. Get the kids involved! They love it! And are more likely to eat it if they made it. 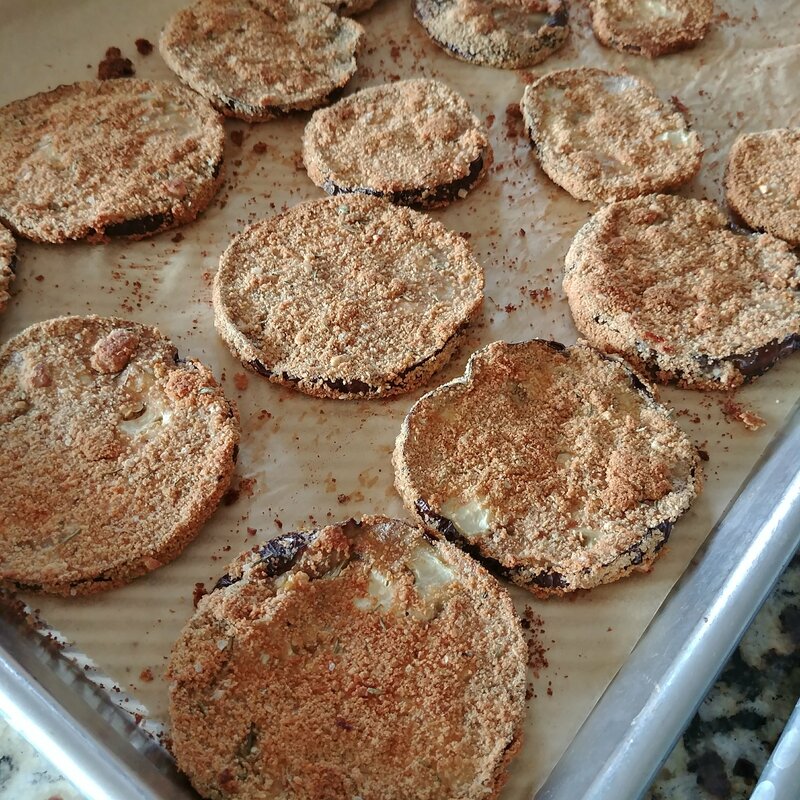 Bake at 400° for 30 minutes flipping the eggplants with tongs at 20 minutes. Looking for that browned crispy look. Boil pasta according to packaging. 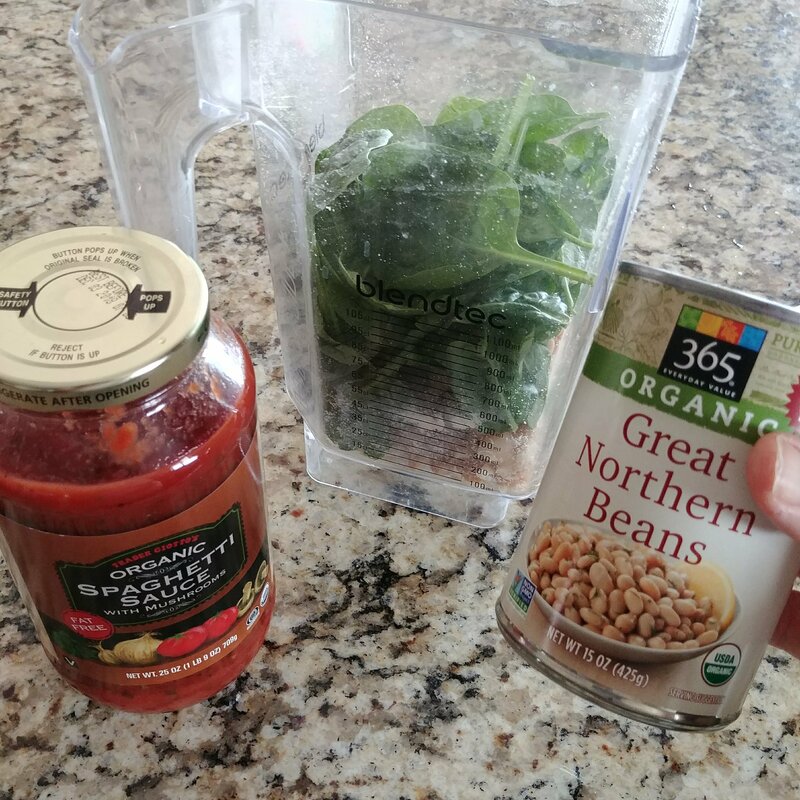 In a blender add one jar marinara and the spinach and drained beans. Blend and heat on stove with other jar combined in a medium sauce pan. *the sauce we used was trader joes fat free marinara. It was tasty! Whole foods makes one too but we don’t like it as much. I served mine on an additional bed of baby spinach. The hot pasta will heat it up a little. Top with more vegan parmesan! 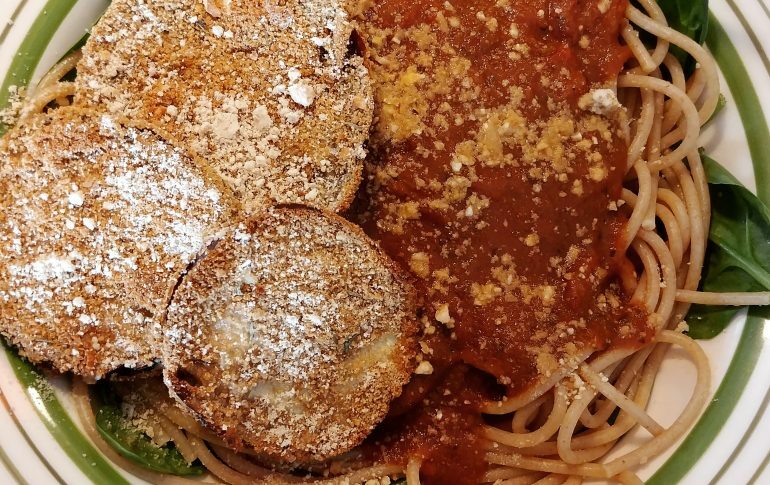 Mom tip: serve the kids eggplant on the side with a marinara dipper! **tip: i used the blender first to make the parmesan. Then the sauce without cleaning it inbetween. Mama Bella is an Italian Native Arizonian and Vegan Chef, she and her family are Vegan and Gluten Free. She believes in fueling our bodies with nourishing food, feeding our minds with love and acceptance, and celebrating our spirits with the art of joy, sometimes in the form of a tiny cookie (from our dessert recipes! ), because life is all about living in that sweet and sacred space of balance. She and her family are also Radical Unschoolers, Minimalists, and use a Holistic approach to healthcare. Eat Well. Be Well. Simply Be. Love. 2019 © BellaVirtue. All Rights Reserved.